The North Florida School of Special Education in Jacksonville announced a $6 million fundraising campaign Wednesday for a new 32,000-square-foot building and therapeutic equestrian center. The expansion will allow the Arlington area school, which serves mild to moderately disabled students, to boost enrollment from 160 to 250 and add equine therapy to the programming. The school, which turns 25 in 2017, has a waiting list for all of its classes. About $2 million has already been raised — during a “soft campaign” begun in May — including $1 million from local philanthropist Delores Barr Weaver. Her name will grace the equestrian center. The new building will feature eight classrooms; fine-arts center with studio, art room, music room and stage; individual therapy rooms for sensory, physical, speech and occupational therapy; physical therapy complex with gymnasium, basketball court and locker rooms; infirmary, library and quiet room; and café, lounge and two covered patios. Also planned are a culinary kitchen and commercial teaching kitchen to support the school’s culinary arts program, in which students produce Barkin’ Biscuits, an all-natural dog biscuit brand sold at local retailers. The therapeutic equestrian center will include a riding area, viewing deck and horse barn with four stables, tack room and office. Therapeutic and recreational horseback riding can help disabled individuals’ strength, range of motion, attention span, circulation and self-esteem, and improve their language skills, balance, coordination, posture and muscle tone. The center will be led by a certified equine therapist and be open on afternoons and weekends to other disabled people living in North Florida, according to the school. With the existing 9,000-square-foot classroom building, the expansion will bring the total school size to 41,000-square feet on eight acres. The school was founded in 1992 by a group of parents seeking better educational opportunities for their children with intellectual disabilities. Now it has 120 students ages 6 to 22 and 40students age 22 and older in a post-graduate program. The curriculum includes academics, social skills instruction, speech, language, occupational and physical therapies, vocational training, adaptive physical education, music and art, as well as independent living instruction, job placement services and horticulture and culinary arts. 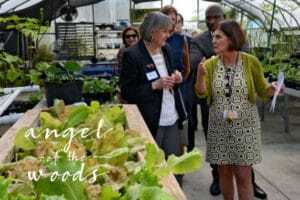 In addition to Barkin’ Biscuits, the school’s other “self-sustaining industry” is Berry Good Farms, an on-campus organic farm with fruits, vegetables and herbs, as well as hydroponics, aquaponics and a greenhouse. The farm educates and employs disabled people and even supplies its own food truck. For more information about the capital campaign, contact Manager Kit Thomas at (904) 724-8323, kthomas@northfloridaschool.org or go to northfloridaschool.org/giving/capital-campaign. For more information on Berry Good Farms, contact Director Ellen Hiser at (904) 724-8323 ext. 245; ehiser@northfloridaschool.org or go to berrygoodfarms.org.